Welcome to the YOUR EXHIBITION SHOOTOUT announcement for April 2019. This is a monthly series in which we encourage you to produce new images around a set theme, and you have the chance of receiving a zine from our collection. Before we get on to this month’s theme, we’d like to congratulate Valentin Jarridge for winning the March SHOOTOUT. We couldn’t agree more with Jules Le Moal’s choice. We love the motion in this image; it adds a wonderful element of mystery to this figure. It is certainly a worthy winner of Jules’ Useful Idiocy. Make sure you’re following Valentin here. Unfortunately Jules’ Useful Idiocy is sold out, but he occasionally sells prints. Make sure you’re following him so you don’t miss his next print sale. You can do so here. 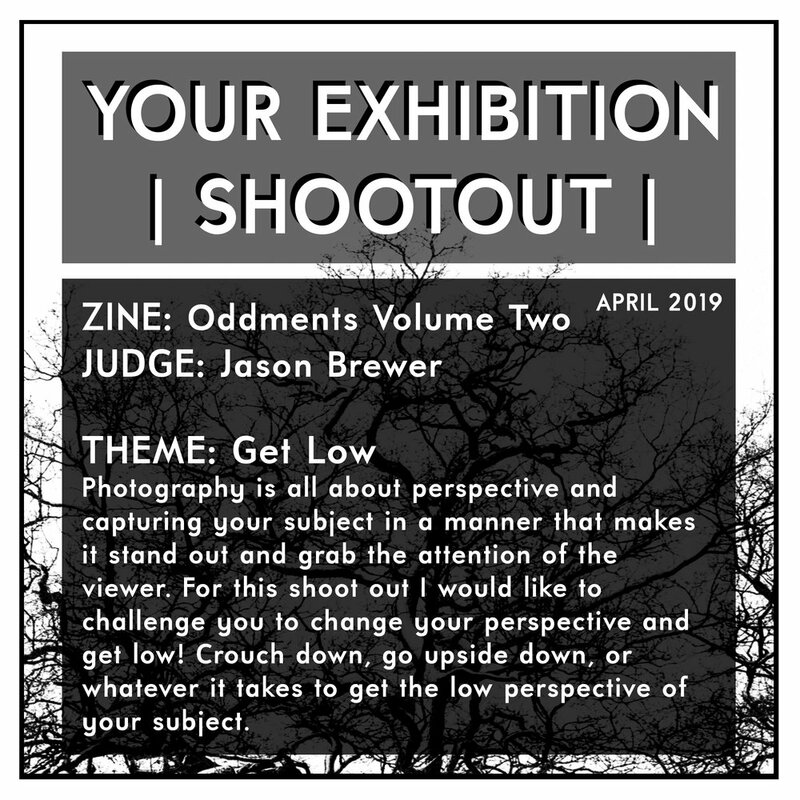 Now it’s time for the April SHOOTOUT, and it comes courtesy of Jason Brewer and he’s donated a very special zine: Oddments Volume Two. We absolutely love this zine. There’s a clear evolution from the first volume, and the imagery is beautifully diverse due to the sub-narratives. To learn more about this zine, check out the A LOOK AT article we published here; a great zine for anyone to pick up. Photography is all about perspective and capturing your subject in a manner that makes it stand out and grab the attention of the viewer. For this SHOOTOUT I would like to challenge you to change your perspective and GET LOW! Crouch down, go upside down, or whatever it takes to get the low perspective of your subject. This is a pretty fun brief, right? We’ve all had to get low to capture something at some point, but why not take a new photo? What ways can you interpret GET LOW creatively? We look forward to seeing your entries! Simply upload your analogue image(s) to Instagram, tag us (@YOUR_EXHIBITION) in the image, and use the #YES0419 hashtag. We look forward to seeing how you interpret GET LOW. As usual, the SHOOTOUT will run for the whole month and the winner will be announced on May 1st!